Available in paperback and e-book: order details below. Carol Mathewson has a problem. Lots of them, in fact. As the new CEO of Kinsley Valley Health Service, she’s taken over the helm of an organisation that ranks last in the state for both consumer and staff satisfaction. She loves a challenge—but having just six months to get those results out of the basement is more of a challenge than she bargained for. Her Executive Team is divided, many staff are resistant to change and there are players inside and outside of the organisation willing her to fail. Read an excerpt below. In The Point of Care, I take care and service improvement from the dry and technical topic it can be and embed it in the story of a CEO trying to make a difference against the odds and against time. 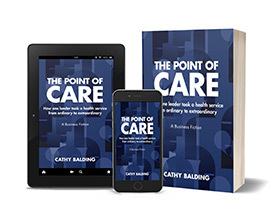 This is a story that anyone in health and human services can relate to, and can help get the key players in your organisation about what a quality system is and what it can do for your consumers, your staff - and you! And it's not just a story; all throughout are my best tools, tips and models for creating consistently great care in your service including: leadership, change, planning for great care, implementation and improvement; and the human side of change is also tackled via staff engagement and cultivating the right mindset and culture for the best results. Anyone in a leadership role in a health or human services organisation, responsible for providing a great service, will relate to and be able to apply The Point of Care lessons and tools. I hope it helps you in your quest to create great care with your consumers! TPOC PDF e-book available via this website ($14.99 AUD): click the Buy Ebook Now button below. - Joanne Hardy, Quality and Safety Partner, Silver Chain Group. 'The Minister for Health sat stony-faced. This was clearly not a social call. Carol Mathewson stared out the window of her office at the sparkling new inpatient building opposite. Hundreds of doctors, wearing identical white coats, poured out of the sliding glass doors and down the street in military formation. Like the water carrying brooms in Disney’s The Sorcerer’s Apprentice, their march was relentless and apparently endless. If you would like to be added to the QualityNews list, to receive monthly quality-related updates, articles and links to useful improvement and governance tools and information, click on the "Free Quality Assessment Tool" button in the website header or footer to subscribe. You'll also receive - you guessed it - my free one-page quality system performance assessment tool. You and other quality leaders in your organisation or service can use it to take an honest look at what your quality system is achieving and to plan to get the results you want - and need. Break out of the compliance rut and get a better return on investment for all that hard work at point of care - where it counts.